Hey folks, I got a bit of a problem....I cant get my mother-in-laws train set running in the living room I had it running ok with an oval earlier, and so we then went and made the layout bigger, around the living room, under the couch, and under the christmas tree......now it won't run.....Ive tried 4 different locos, and it seems that there is no power going into the tracks now......Im not getting why. It worked when it was more or less an oval, and now we've put in 3 switches and are not getting anything. Anyone able to help me with my problem ? Im running bachman HO, with that bachman 'snap' track on the raised ballast lookalike so one can run it on carpet or anything else. As it stands, we are running it on hardwood floors. Am i only supposed to have one of these on the track at any given time or what ? I would agree with Kennedy's comment. Unless you have two separate ovals. One power Pack is all you need and can use unless you can isolate certain sections of the track. Normally layout such as the one you described are not set up for that. I think what happened is the two power packs are fighting each other for control and direction. As a result no current to the engine. In my crack drawing of the layout plan, the black is the basic oval, with no switches, and It runs great. However the blue is what I had originally set up, with 3 switches, and since I took all the switches out, It will run. NOTE : all of the track is the bachman 'snap' track, including the switches, and all track and switches is brand new out of the packages. With the switches, I made it more or less so the train and the consist could 'wye" or change directions without me having to turn the train around by taking them off the tracks. Somewhere and somehow this setup with the switches shorted?? out the track configuration and the train would not run. When i took the switches out and ran with no switches, it ran. So, somewhere in me placing the switches , Im thinking by me making it so the train could change directions by taking a certain route, it shorted the system out. Make sense to anyone ? Any way to solve this problem ? ? or am i stuck with making more or less a siding, and not being to change the direction of the train without lifting it off the tracks ? TIA all, I know I probably have made this a whole lot confusing. It's the reversing segment causing the problem. You could put insulated joiners in one end of the reversing segment, but then you still have a problem when the train goes to cross the insulated joint becaus the polarity will reverse. There's some relatively complicated wiring (for a beginner) to get around these problems. 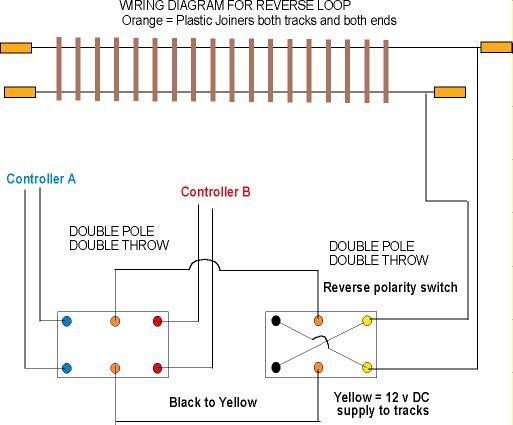 Maybe flip the one switch around, then you have two loops, but both will be in the same direction, leaving the "0-5-0" switcher to change the train direction. All good information previous, I also agree the problem is the reversing loops, and either way you have two of them joined together. Perhaps these diagrams will help you understand the problem. If you still need help or want some suggestions don't be afraid to ask. I know I've had lots of help from the members of this board. Well dont I feel like a tool. Im big into photography and real trains, and my mom-in-law wanted my help for her little train set, and I was puzzled......I eventually figured it was the 'reverse loop' but couldnt remember it's name ! Are those diagrams CB&CNSfan easy to fix em up ? Im still a relative 'newby' to model trains, so would it take some time, or I might as well leave it as it is. Either way, it doesnt really matter, i just thought it would be easier to switch directions at the flip of a switch and take the reverse loop. Thanks for everything folks ! Hehehe... see I figured it sounded like you had built a reverse loop without wiring it up to work, thus shorting it out, but I wasn't sure, hence the request for a map/drawing. Reverse loops can be annoying. If you're building a permanent layout, they can be dealt with with a little extra wiring, but if you're running on the rug, they probably aren't worth the effort. Are those diagrams CB&CNSfan easy to fix em up ? but if you're running on the rug, they probably aren't worth the effort. Hello, I have been reading this thread, and thought I would put up a simple diagram for 2 controllers and reverse loop. When the loco is inside the loop, stop iit and flip the d.p.d.t. switch and change the point over, then change forward/reverse switch on the controller and carry on running the train out of the reverse loop. the only thing to add to this is to make sure that the section of track covered by the previous drawing is long enough to handle your longest engine lashup. Meaning that all the wheels of the powered engines must fit inside of that section of track. I also added lights to the line to determine which way the polarity was thrown. Just don't have the drawing any more.